The Allied HealthCare Assistant program supports our members through every encounter with the health care system by providing the resources they need for the best results. When you need help with the health care system, turn to HealthCare Assistant to be your champion. HealthCare Assistant is an umbrella of health care services available to members and their families. This suite of services was created to ensure our members have the absolute best access to the best health care in the country at the absolute best price. This is accomplished by giving our members access to health care experts ready to guide you through the entire process, at all times. HealthCare Assistant is provided free to Funding Advantage members by Allied National and their employer. If you or your dependent has diabetes, HealthCare Assistant can help you find free testing supplies. If you need surgery, HealthCare Assistant can help you find a Center of Excellence or even seek a second opinion before surgery. The service also has experts who can provide guidance about a mental or behavioral health situation. 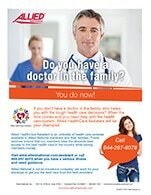 Click the image to the right and download our informational flyer about HealthCare Assistant - a Funding Advantage member's new ally.